NETWORK FINALS: BOB’S BURGERS and the post-JESUS CHRIST SUPERSTAR DATELINE gained 0.1 in final numbers. CABLE HIGHLIGHTS: After a couple of stable weeks, AMC’s THE WALKING DEAD fell 0.32 to 2.63, with TALKING DEAD (back in its regular timeslot) up 0.27 to 0.87, and COMIC BOOK MEN steady at 0.16. On Adult Swim, BUSHWORLD ADVENTURES (aka an unannounced episode of RICK & MORTY) was at 0.63. On HBO, LAST WEEK TONIGHT returned from a week off at 0.41, SILICON VALLEY dropped 0.07 to 0.24, BARRY ticked down to 0.21, and HERE AND NOW lost a tick to 0.10. On Showtime, HOMELAND slipped 0.02 to 0.30, and BILLIONS was also down 0.02 to 0.24, with OUR CARTOON PRESIDENT up 0.01 to 0.06. Hallmark’s WHEN CALLS THE HEART gained 0.04 to 0.23. 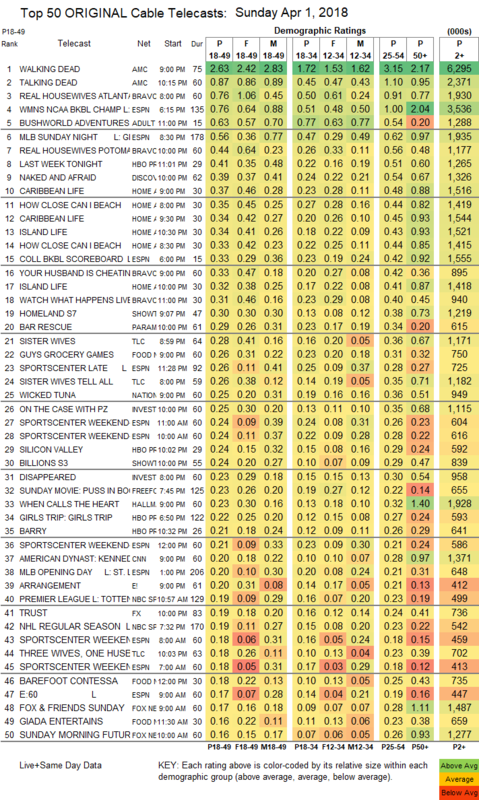 E!’s THE ARRANGEMENT held at 0.20, and THE ROYALS was down 0.02 to 0.16. FX’s TRUST ticked down to 0.19. On Starz, COUNTERPART returned from a week off with a 0.10 season finale, and ASH VS EVIL DEAD (off the chart because the network listed as a rerun, although it was apparently new) fell 0.03 to 0.07/196K. 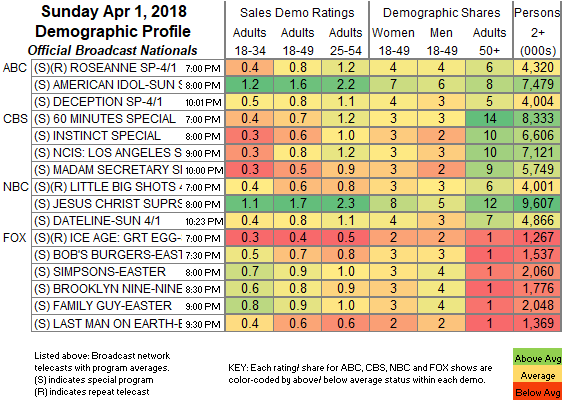 Bravo’s REAL HOUSEWIVES OF ATLANTA season finale tied for the lead in unscripted, down 0.02 to 0.76, with the season premiere of REAL HOUSEWIVES OF THE POTOMAC at 0.44, and the premiere of YOUR HUSBAND IS CHEATING at 0.33. ESPN’s coverage of the WOMENS NCAA TOURNAMENT CHAMPIONSHIP was at 0.76. Discovery’s NAKED & AFRAID shed 0.03 to 0.39. HGTV had half a dozen shows in the Top 20, topped by CARIBBEAN LIFE at 0.37/0.34, compared to last week’s 0.37/0.36. Paramount’s BAR RESCUE ticked up to 0.29. On TLC, SISTER WIVES dipped 0.02 to 0.28, SISTER WIVES TELL ALL was down 0.08 to 0.26, and THREE WIVES, ONE HUSBAND lost 0.05 to 0.18. Food Network’s GUY’S GROCERY GAMES was at 0.26. On ID, ON THE CASE fell 0.05 to 0.25, and DISAPPEARED appeared at 0.23.